Aquatic turtles are fun to watch, especially when they are as unique looking as the African side-neck turtle. If you haven't already guessed, these turtles are named so because they are unable to tuck their heads entirely inside their shells so they tuck them to the side instead. An African side-neck turtle's anatomy differs from that of a typical aquatic turtle such as a red-eared slider. Side-necks have unique cervical spines, extra scutes on their shells, and unusual skull characteristics. African side-necks have longer necks than most other species of turtles. This gives them a distinct advantage over their fellow turtles: If they find themselves turned over on their shells, these turtles can right themselves using their neck muscles. Most turtles are helpless when turned on their shells. You can socialize pet aquatic turtles with frequent interaction, and African side-necks are no exception. They are inquisitive, cute turtles that are interesting to watch. Be advised (especially if you have small children) that aquatic turtles are believed to carry salmonella bacteria. It's important to wash your hands after handling African side-neck turtles, and it's probably better to keep them away from small children, who may be tempted to put the turtles in their mouths. African side-necks are aquatic turtles, therefore, they need a large fish tank that will hold water. Your turtle should be able to swim and dive in their tank so the larger the tank is the better. Ideally, you should have about a 75-gallon aquarium (or larger) that is half to three-quarters full of water. A floating dock or large rocks that provide dry land and an area for your turtle to climb out of the water to dry off are also needed. Fish gravel or sand works well for the bottom of the tank. A quality water filter is needed since aquatic turtles defecate in the water, and without a filter you'll be doing weekly water changes. Some people prefer canister filters while others like the smaller submersible filters. For a large tank, such as a 75 gallon, investing in a quality canister filter is typically your best option. In addition to keeping the water clean, you should dechlorinate the water by either letting it sit out for 24 hours before adding it to the tank or by adding a dechlorinating solution to it. A recommended pH of 6.5 (a fairly neutral pH) should be maintained and can be easily checked with water test strips from the pet store. If you have other pets that are able to get into your turtle's enclosure you should have a metal mesh screen lid to keep your turtle safe but still allow heat lights to heat up the enclosure. Like all other turtles, African side-necks are reptiles, not fish or amphibians. Therefore, they require supplemental heat to maintain their body temperatures along with UVB rays to properly metabolize calcium and Vitamin D3. Both heat and invisible UVB rays can be easily provided in the form of special light bulbs from the pet store. Heat lights vary in wattage and should maintain an ambient temperature of about 80 degrees and a basking temperature of about 90 degrees. The temperature should never drop below 70 degrees, even at night when the basking light gets turned off. UVB rays also can be provided in the form of fluorescent light bulbs (both compact and traditional tube lights) that should be kept on a 10 to 12 hour light cycle. The bulbs should also be placed about 10 to 12 inches from where your turtle sits outside of the water. These special bulbs emit visible white light alongside the invisible UVB rays. These invisible rays will expire after about six months so it is important to replace your UVB bulbs even if the white light remains on. Like most aquatic turtles, African side-necks are omnivores. 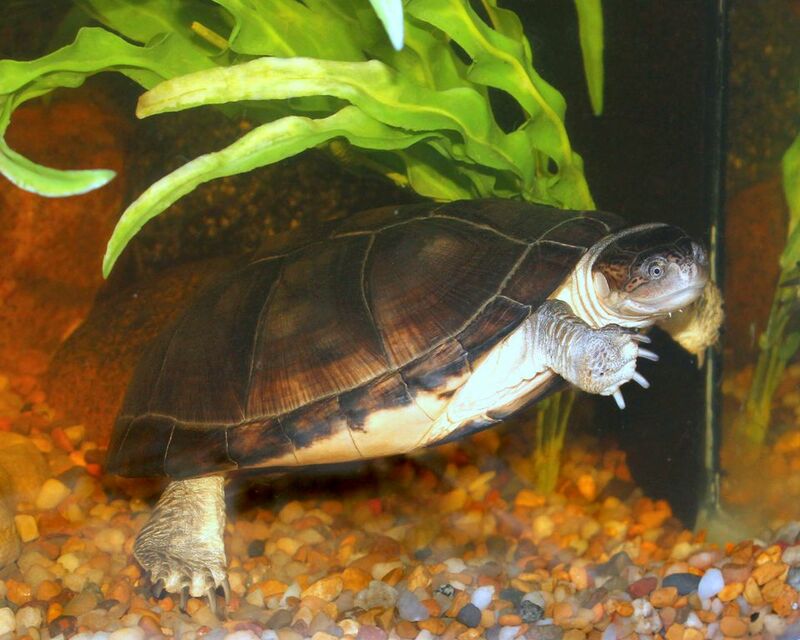 They eat some plant material but they also eat insects, fish, crustaceans, and aquatic turtle pellets while swimming. Meat (such as chicken and beef) should never be fed to your aquatic turtle. Turtle pellets should include the calcium and other vitamins and minerals that your turtle needs. Feeding your turtle as much as he will eat in a 15 to 30-minute period is all it really needs in a day. Remove the uneaten food so that it doesn't spoil or clog the filter. As with most reptiles and turtles, your best bet is to get an African side-neck turtle from a reputable breeder. Look for any signs of illness, such as flakiness on the shell, difficulty breathing, lethargy or low appetite. Aquatic turtles are often afflicted with parasites such as roundworms. These are tricky to treat, because the turtle may not show obvious symptoms. An exam by a reptile veterinarian is usually when parasitic infections are discovered. African side-neck turtles also are prone to vitamin A deficiency, which may have symptoms such as swelling and pus around the eyes. Like most reptiles, African side-neck turtles are predisposed to respiratory infections. You may notice your turtle wheezing if it has a respiratory infection, or notice excess mucus around its nasal passages and mouth. And shell rot, perhaps the most common illness to affect aquatic turtles, is also a concern for African side-necks. This disease usually begins as a fungal or bacterial infection, and as it progresses, can cause painful ulcers on the turtle's shell. All of these conditions should be treated by a veterinarian who specializes in reptiles. Don't try to treat a sick turtle with a home remedy before checking with your vet first.